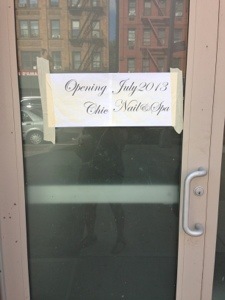 Another nail salon opening in Central Harlem, Chic Nail & Spa | HarlemGal Inc.
Nail salons are becoming just as popular as new restaurants in Central Harlem. 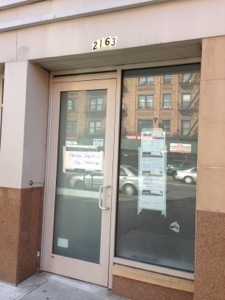 The same Twitter follower who told us about Lilac Nail & Spa on 110th Street between Frederick Douglass Blvd and Manhattan Avenue now tells HarlemGal Inc there’s another nail salon place opening on FDB between Levain Bakery and Harlem Tavern. It’s called Chic Nail & Spa at 2163 FDB. The sign on the door says coming in July 2013! So stay tuned! This entry was posted in 110th Street, business, Frederick Douglass Blvd., Harlem, Harlem blogs, Harlem businesses and tagged 2163 Frederick Douglass Blvd., Central Harlem, Chic Nail & Spa, Harlem. Bookmark the permalink. Thank you for the heads up on your opening! Much appreciated!